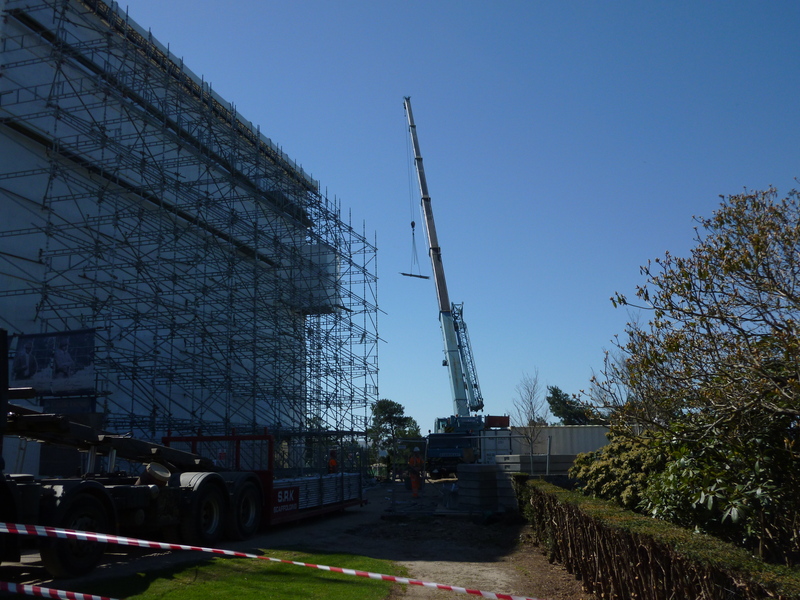 The south end of the castle is now watertight, and the scaffolding over the next 5 weeks will be coming down. 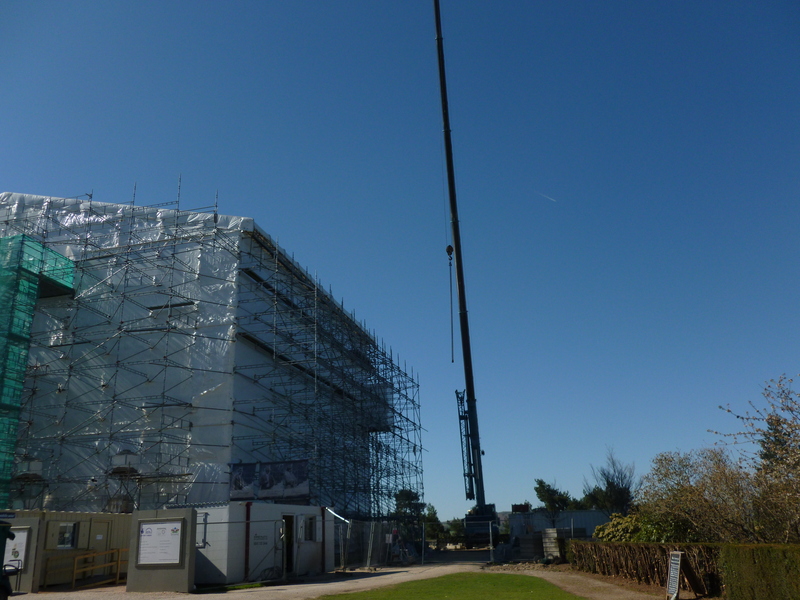 Today a crane is here taking down large sections of scaffolding and it will also be putting large pieces of granite onto the roof. It’s a very excit ing time now that one part is now completely finished, the windows are all back in and as the builders take down the scaffolding each level is being cleaned. 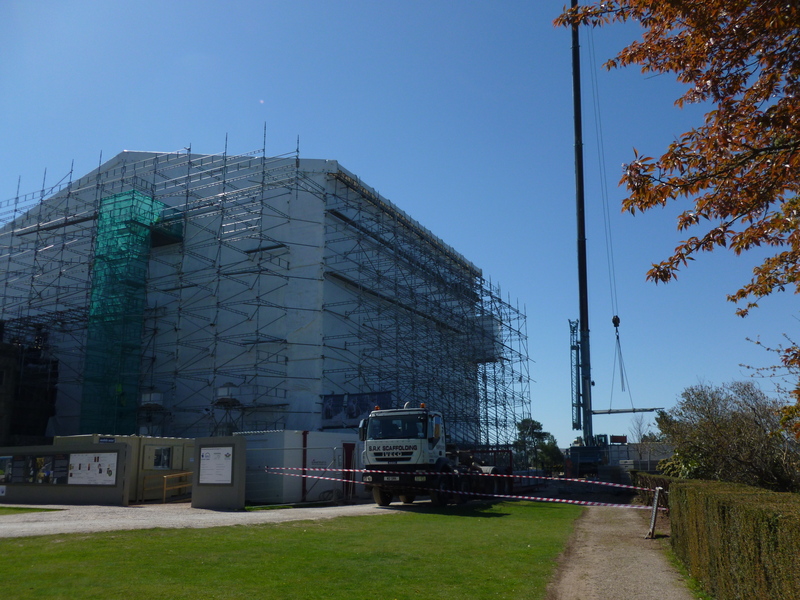 During the late summer the chapel will be reopen as the scafflding over the central section comes down. During the first phase of Castle Drogo’s major building project to save the castle, Codsteaks, a creative design company, helped interpret the importance of the building project. Codsteaks sculptural work spans from looking at the details of the architectural and building work, archived letters of the building work and a tribute to stonemasons and family members who went to fight in The First World War. 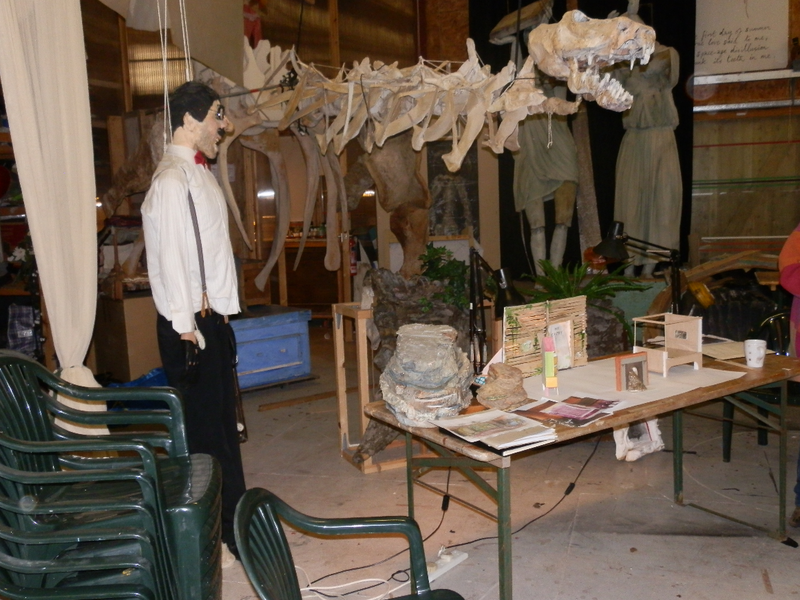 As the castle moves into Phase 3 of the building project and is being creatively reinterpreted for 2015, Codsteaks visited the castle to re-install their sculptures into new spaces. 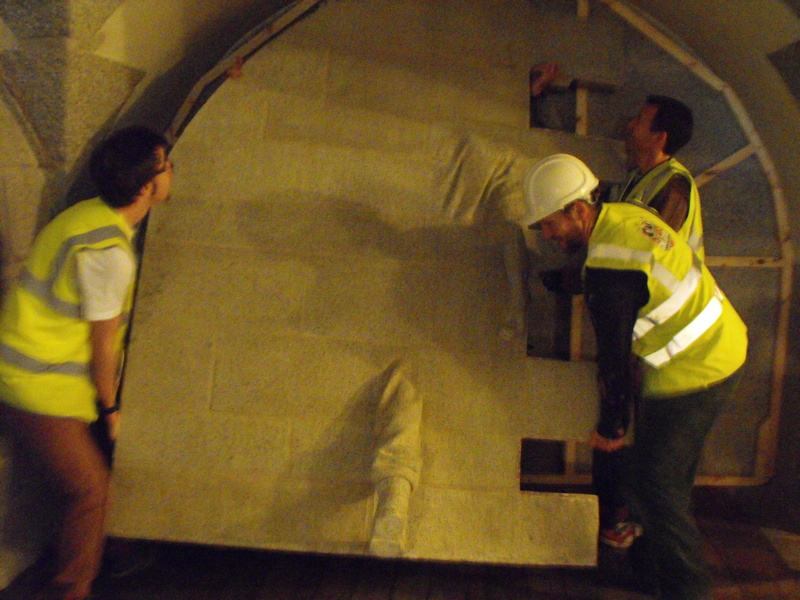 The ‘Building Section’ which was originally presented in the dining room has now been re-installed in the gun room. 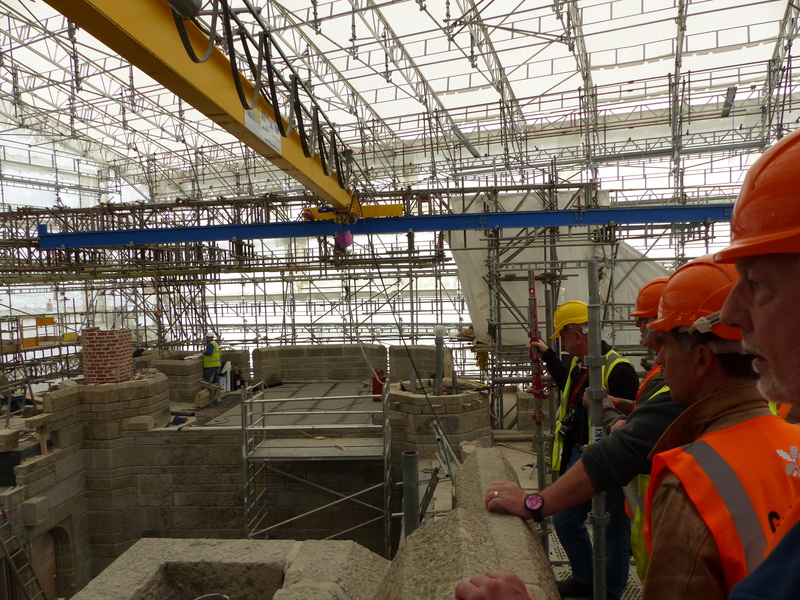 This structure reveals the detailed layers of materials that architect Lutyens used to build the castle. This visually helps to technically explain why the castle began to leak and what needs to be done to prevent it. 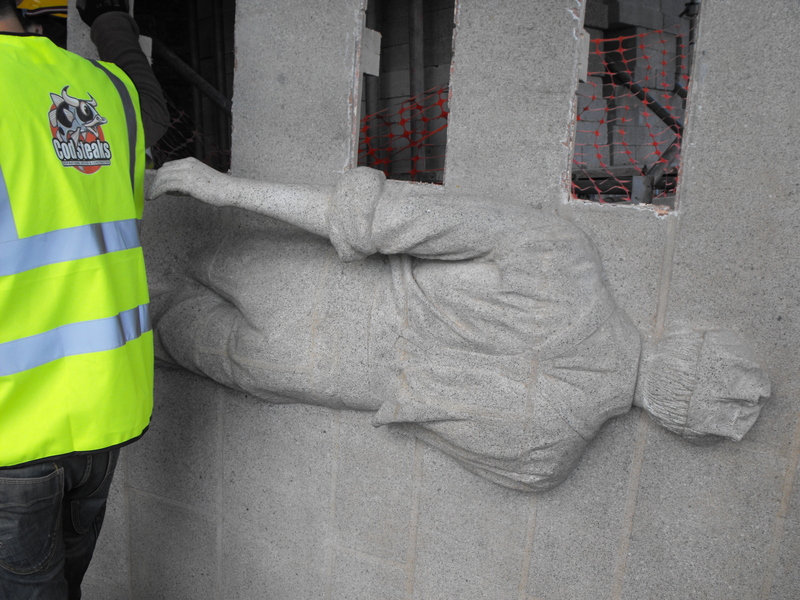 Codsteaks also re-installed the fantastic ‘Call to Arms’ sculptural piece. 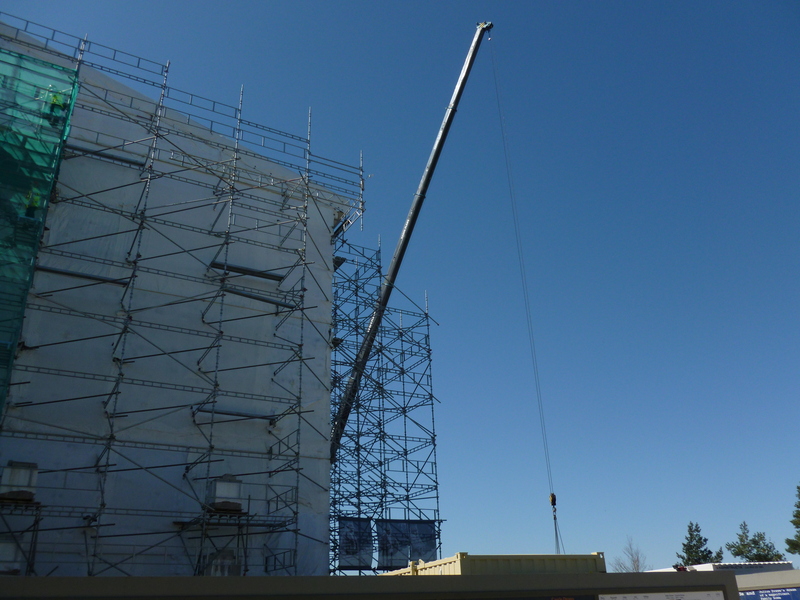 These three photographs below show the developmental stages of the work being re-installed. 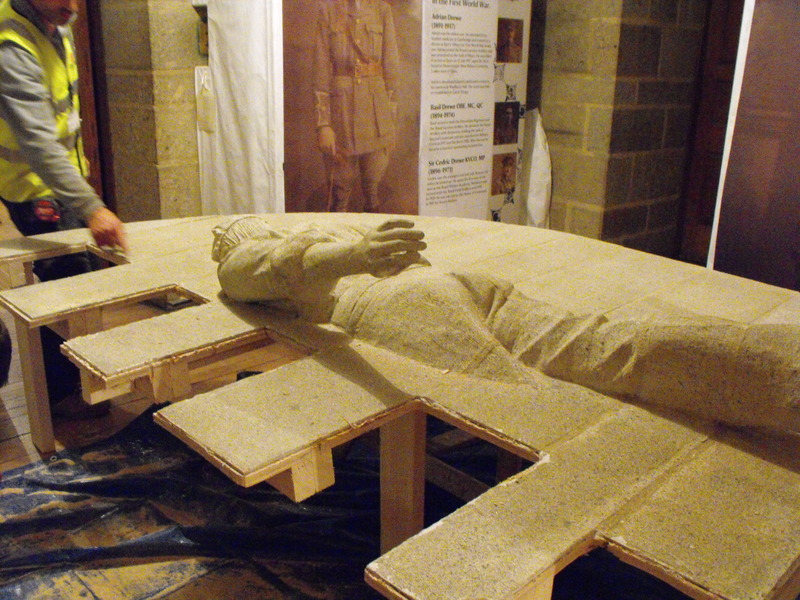 The pictures show the sculpture being cut in half so that it can be easily moved through the castle and then re-installed on the wall in the Chapel. 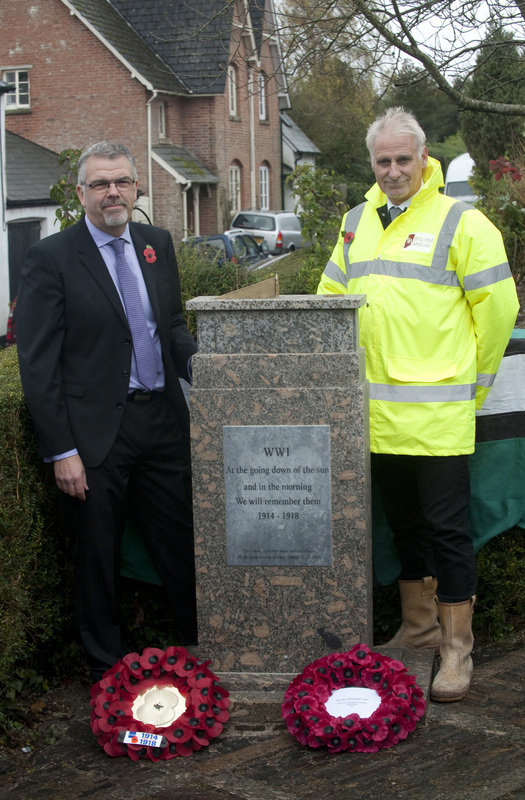 This piece plays tribute to the men who were lost in the First World War. 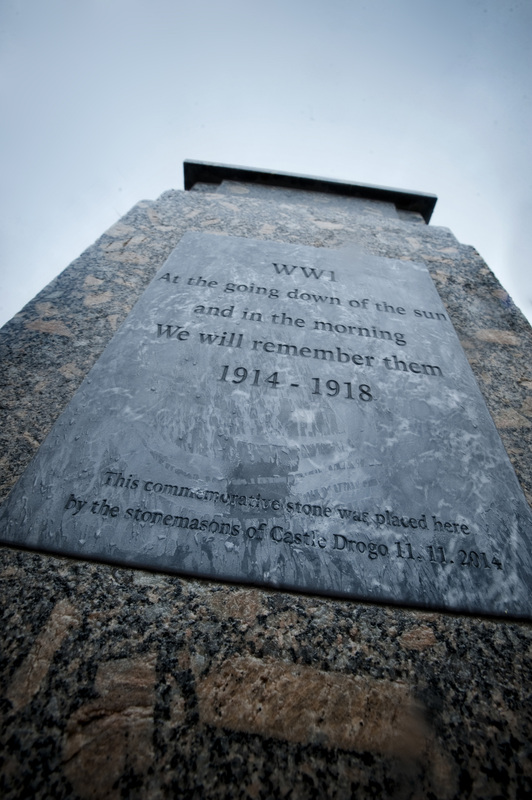 Mr Julius Drewe’s eldest son Adrian and many of the stonemasons and were sent off to war whilst Castle Drogo was being built. These heart-felt and fascinating sculptural works will be back on display in the summer of 2015. 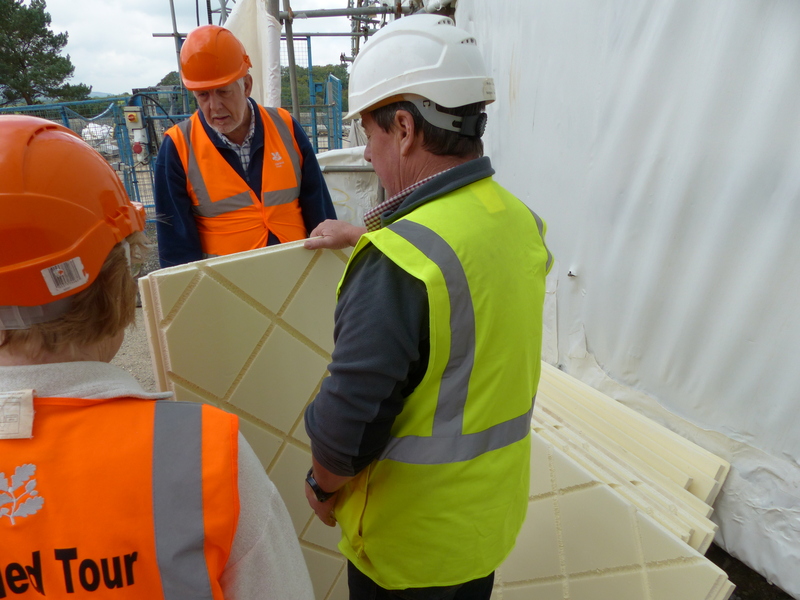 As the conservation project at Castle Drogo continues through the winter months we have invited 4 creative partners to produce brand new interpretation for the next phase of the building work. From next March these artists will help visitors explore why the project is so important, and to create their own artistic responses to the castle and the landscape. 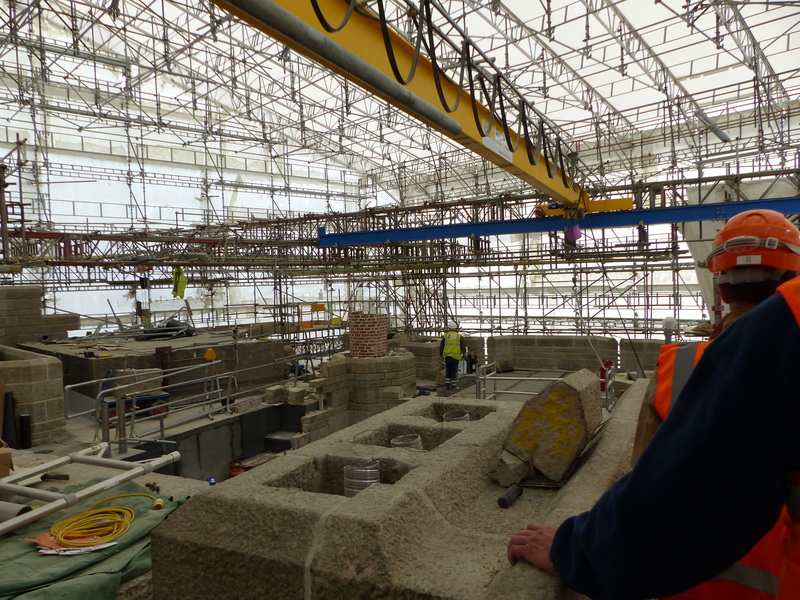 Creative partners have approached this opportunity by exploring the stories of Castle Drogo, the people who built it, the family who lived here and responding to the collection, whilst the castle is going through a period of change. • MDesign’s interpretational work for Castle Drogo explores the parallel timeline switching between 1915 and 2015. Using the Castles archive and the present day construction, MDesign are making playful engaging works that span from impressive films, interactive gadgets and fictional stories that explore the collection. They are also teaming up with Forkbeard Fantasy to imagine the Castle if it was left to the elements. • The Dovetail Foundry have been inspired by the buildings architecture, stories of the family and their hopes and dreams. Their installations and interpretation will involve existing collection items to explore family stories and architectural features designed by Edwin Lutyens in the early 20th century. • Jill Smallcombe’s work explores the collection of textiles at Drogo and delves into the history and conservation. Central to her interpretation will be the symbolic and powerful ‘Char de Triomphe’ tapestry which is returning to the castle in March following extensive conservation. Jill’s interpretation will show us the ‘behind the scenes’ of the Tapestry which links in closely to the current experience of the Castle which is also going through renovation. 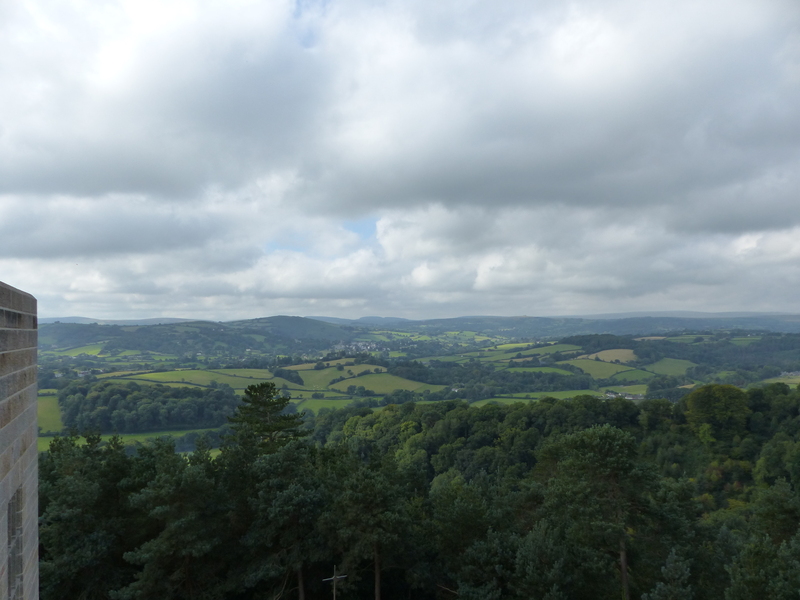 • As a successful photographic artist, Mike Smallcombe is currently in the process of creating large scale images that link to the Castle Drogo estate and narrative threads of its history. These images will visually interpret stories of the castle and of the Drewe family as well as generating an opportunity to explore the estate in more detail. There will be weekly updates about the development of the creative work that will be open to visitors on Monday 9 March 2015.